I’m becoming convinced that Rebel Park must be some kind of wild weather vortex. Last night we saw an event that topped even the Great Hailstorm of 2009 as the vicious storm that tore through Ohio and West Virginia reached New Market around 9:00 and interrupted a game that was almost as wild as the weather. The contest featured six home runs in 4 innings plus, but the game will have to be played over from the beginning and all statistics will be wiped out. The umpires did their best to get the game in, but when one light tower went out and a terrible wind began to blow the game was called and the fans began to scatter. This storm was pushing so much dust around that the exodus from the parking lot looked like Okies exiting the Dust Bowl. Of course, last night’s stats weren’t the only thing wiped out by the storm. 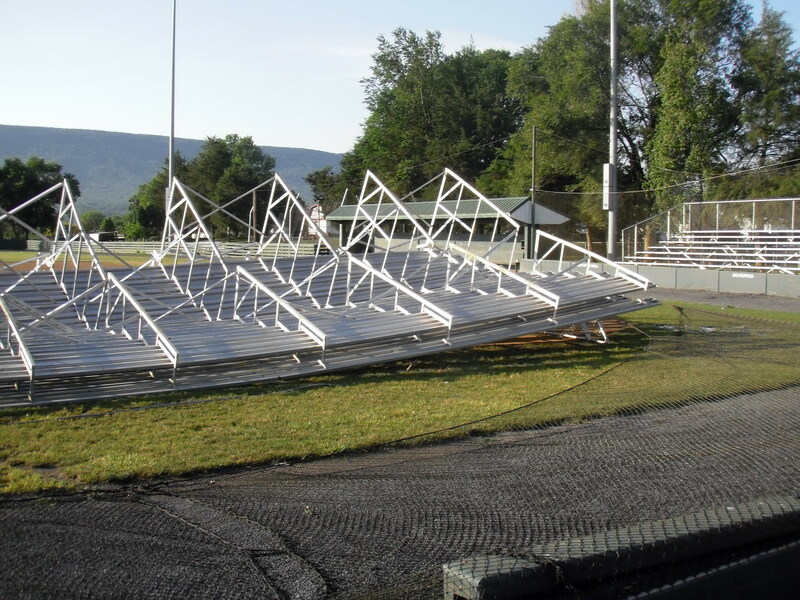 By what little light remained, those of us holed up in the press box and the concession stand watched as the unbelievable wind at first pushed our third base grandstand forward about three feet, then lifted it off the ground and carried it onto the field. It came to rest on the foul line, the very end touching home plate. At that point, it was agreed that those of us who were up in the press box needed to move down to the concession stand. Our players had all run to the Algers’ home which is just down the right field line. Unfortunately for outfielder Pat Porter, a limb crashed through the rear window of his car, taking a side mirror with it. The storm finally passed and we picked our way through downed branches and lots of leaves to our respective homes. Back in the cabin where Al and I sojourn in New Market, we reflected on how much worse it could have been had anyone lingered in the stands. “Front Row” Fred would have definitely become “Airborne” Fred. Front Row Fred, Missy, and Melissa survey the damage. 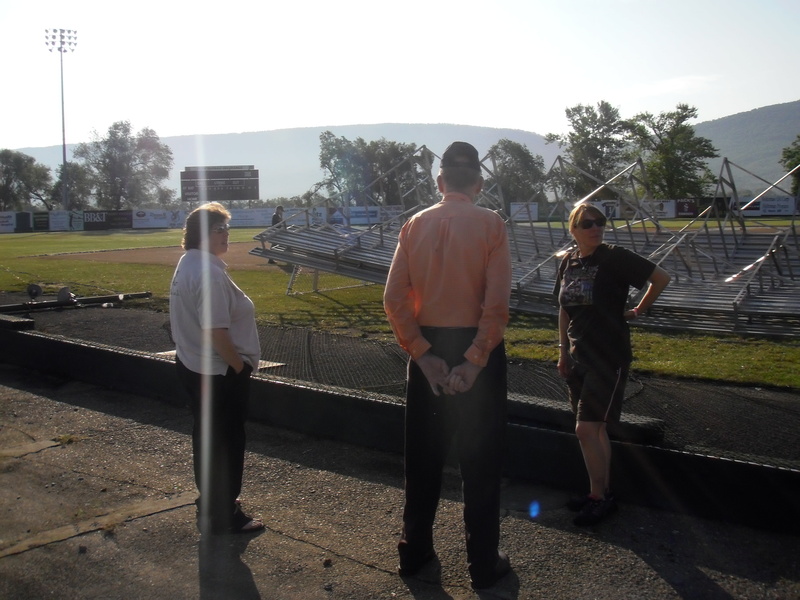 This morning, Al and I stopped by on our way back to Williamsport to inspect the damage in the daylight. When we arrived at Rebel Park there was Fred and his daughter Missy, as well as Melissa Dodge, camera in hand as usual. Our groundskeeper, Marvin was there. Soon our Team Meal Coordinator Becky Kipps came over. I looked at those folks who were looking at those bleachers, and once again I felt so fortunate to be part of a group of people who care–about the team, about the town, and about each other. As much as I love baseball, that’s really the attraction of the New Market Rebels. Late word is that the game has been suspended and will be resumed in the top of the 5th. That ruins my segue, but improves the scheduling. This entry was posted in New Market Rebels and tagged Becky Kipps, Front Row Fred, Melissa Dodge, New Market Rebels, Pat Porter, Rebel Park. Bookmark the permalink. 2 Responses to Up, Up and Away! First let me say how happy I am that no one was hurt by the storm.God had his hand in that. The same storm that was experienced in New Market, also knocked out power to nearly one million BGE customers. I lived at work over the weekend, and today is the first break that I have had. The damage was massive, and most customers can expect to be without power through the weekend. I will return back to work on Wednesday. Hopefully, the power will be on in Frederick tomorrow night. Again, as you said, in this blog, as well as your book, the Town of New Market rallied together during a difficult time. I know that they are glad that that you are a big part of it. Thanks, Don. That’s a very kind thing to say. As for tomorrow night’s game–I don’t think you’ll need a jacket!